As you know Rewards Canada has partnered with Give A Mile, the miles and points crowd funding charity helping families fly to see loved ones who are ill. We detailed Give A Mile back in April here on the blog and are happy to give them more coverage for their latest campaign. 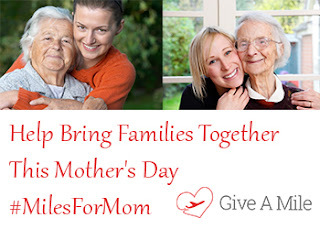 Right now Give A Mile us looking to raise miles and make flights happen for mothers and fathers to connect with their loved ones with their Mothers/Father’s day campaign. This campaign runs May and June and we encourage you to help out! All you have to donate is 1,000 miles, points or even cash to make things happen. Visit Give A Mile today for more details! When Tracy wrote from Calgary to describe her mother-in-law Charlene, she talked about how important Grandma had been to their three boys, her boundless generosity towards others, and how much of an example of strength she had been for Tracy personally. Charlene had been battling cancer for 3 years when Tracy found a lump in her own breast, and her mother-in-law encouraged her through two surgeries, chemotherapy and radiation treatment. Now Grandma Charlene’s own cancer had moved from her lungs to her chest and liver, had metastasised and was in her brain. In November 2016 the doctors in Ottawa suggested Charlene had a maximum 3 months to live. Tracy’s husband had lost his job in the Alberta oil field and was working in Calgary, the only bread-winner in the family so was not able to go. One of their three sons had moved back home to help out but was not yet working so Tracy reached out to Give A Mile for help to fly that grandson, Dillon, and herself to see Charlene for the last time. A Give A Mile flight of compassion was awarded which allowed Tracy and Dillon to spend several days in Ottawa visiting grandparents in December 2016. Once home in Calgary Tracy wrote expressing gratitude for the trip that she and Dillon were able to take saying that they tried not to dwell on the fact that this would be the last time they would see Charlene, and instead spent many happy hours sharing stories and looking at family photos. Each day they would leave the visit with a warm feeling and smiling. 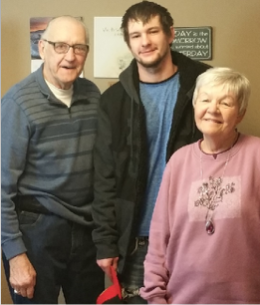 Dillon got to spend valuable time with his mother and grandparents, and say goodbye to his grandma. got to say our good byes in case we don't make it back. Thank you so much to your organization for this truly remarkable gift! Founded in late 2012 by crowd-funding flights of compassion with unused travel miles, a 100% volunteer organization, Give A Mile celebrated a big “300 flights (and counting..)” milestone in early 2017. They have expanded the donation options and continue to build corporate partnerships and a volunteer base. Please donate or get involved with Give A Mile and allow important moments with mothers, grandmothers and other family members to occur when needed most.